President Trump has nominated Herman Cain and Stephen Moore to the Federal Reserve board, choices that Nancy Pelosi called "ill-suited," "embarrassing," and "the worst." 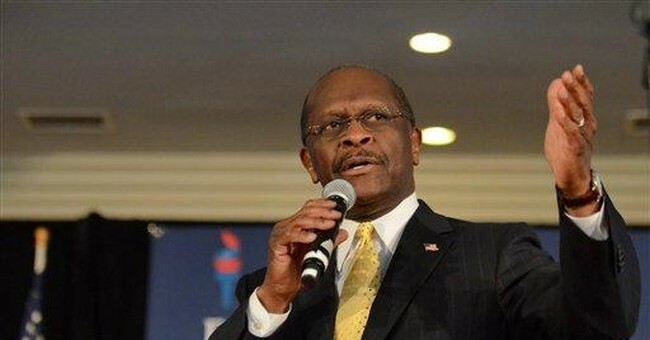 Cain, the former Godfather’s Pizza CEO, became synonymous with his famous tagline, "9-9-9," when he was running for president in 2012. That is, a 9 percent income tax, a 9 percent corporate tax, and a 9 percent national sales tax. He told voters he'd implement the plan in his first 90 days as president. Moore is an economics expert who served as an adviser to Trump's 2016 campaign. He frequently offers analysis on CNN and other news networks, promoting "Trumponomics." Yet, he has broken with Trump on the issue of trade, saying the president was "absolutely wrong" when he attacked NAFTA. "It’s not clear to me whether that’s reality or a Saturday Night Live skit," Rep. Hakeem Jeffries (D-NY) said of Trump's choices. "It’s an embarrassment. The likelihood is they will be withdrawn because even Republicans are aghast at the fact that you could nominate singularly unqualified individuals such as Herman Cain." Just a second, though. It's apparently not just Democrats hesitating with Trump's new nominees. Four defections could be enough to doom Cain's chances. Trump has signaled he wants changes at the Federal Reserve, frustrated by Chair Jerome Powell's past decisions to raise interest rates. It at least appears they won't be raising rates this year.